Why Support the Westfield United Fund? 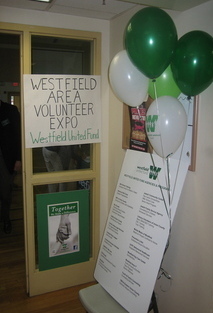 We hosted our fourth annual WAVE (Westfield Area Volunteer Expo) this year, with 30 local organizations participating. The Westfield United Fund is a Network of Services. Our agencies work together to provide the many related but different services a family or individual might need. For example, an at-risk teen might need the services of Caring Contact, the Westfield Area Y, and Youth & Family Counseling Service. We Know Where the Needs Are. Research conducted for the WUF shows that programs are needed to serve the frail elderly, low-income families, troubled youth, and handicapped people of all ages. Your Gift Goes Far, But Not Far Away! One of the reasons that our town is so attractive is the variety of services available. The Westfield United Fund's community-wide campaign is the most efficient and accountable way to coordinate those services to care for people in need.